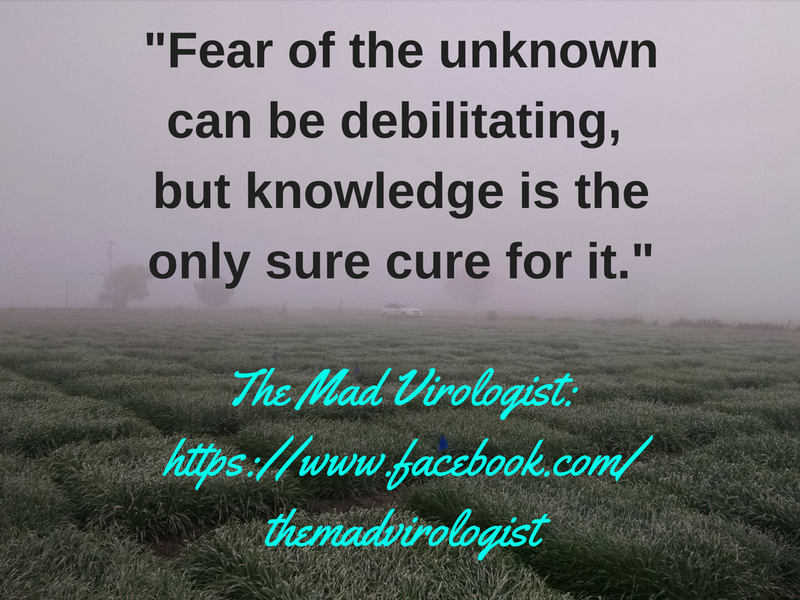 This blog covers the wide world of virology and science advocacy. Recently, a dairy company that sells milk and yogurt posted a video where they asked children to recite what "GMOs" are. Naturally, the kids repeated back things that they likely heard from their parents without understanding what they were talking about (more on this in a second). The outrage from consumers was quick. People were not happy that a company was marketing their products by calling into question the safety and "wholesomeness" of their competition. Stonyfield responded to the criticisms and complaints from their customers in one of the least professional ways possible: they called them trolls and started banning them from being able to voice their complaints directly to the company on social media platforms. 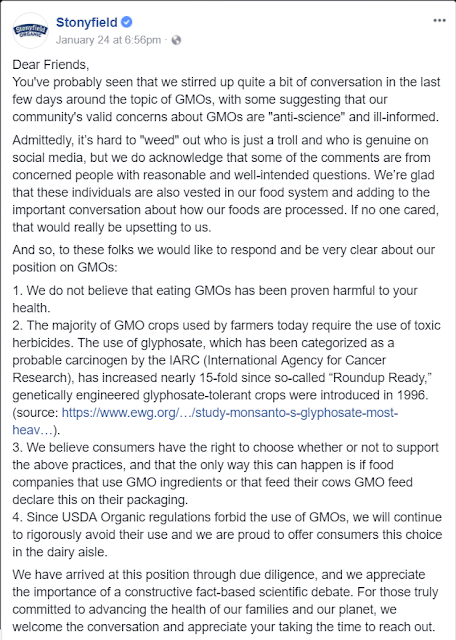 The Farmer's Daughter blogged about it here (the link also includes the video in question), but to make it easy, I'm attaching screenshots of what the company said about consumers who were complaining. After I wrote that, I went to bed and by the next day, myself and at least another 30 people who had commented during the night had their comments deleted. I was also banned from the page, so I suspect that the other people were too. So many people have been banned from the page within the last 48 hours that a group was created to document the number of real people who had been banned by Stonyfield. 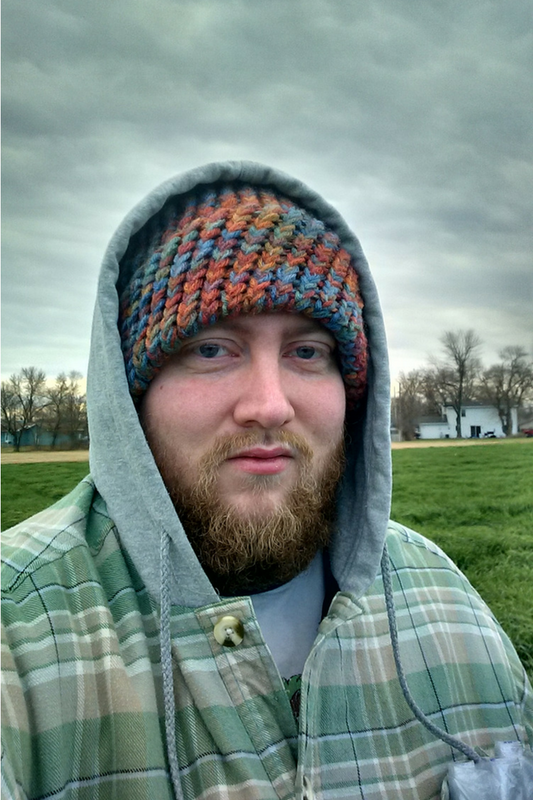 Members of the group range from concerned parents to farmers to scientists like myself. Many people fall into several categories (I'm both a parent and a scientist). Although Stonyfield claimed that they were interested in listening to the concerns of consumers, they have silenced anyone who disagreed with what they did. 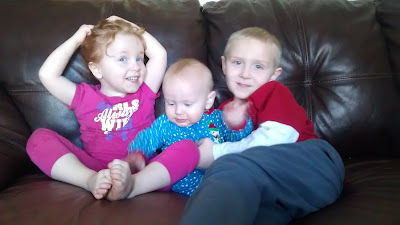 Since Stonyfield must has thought that I was a paid troll, here is a photo of my kids (it's hard to get them to sit still long enough for a good picture) and a picture of me collecting samples from a wheat field. I'm a real person who is not only a parent, but an agricultural scientist. I wasn't the only scientist that got banned and had their comments deleted. It also happened to Mommy, PhD and Thoughtscapism, to name just two examples of many. So why were people outraged enough to comment on a page that has been publicly been calling consumers trolls and deleting even the most respectful of comments? It goes back to the video that they shared. To be up front, I have no problem if people want to buy organic produce. 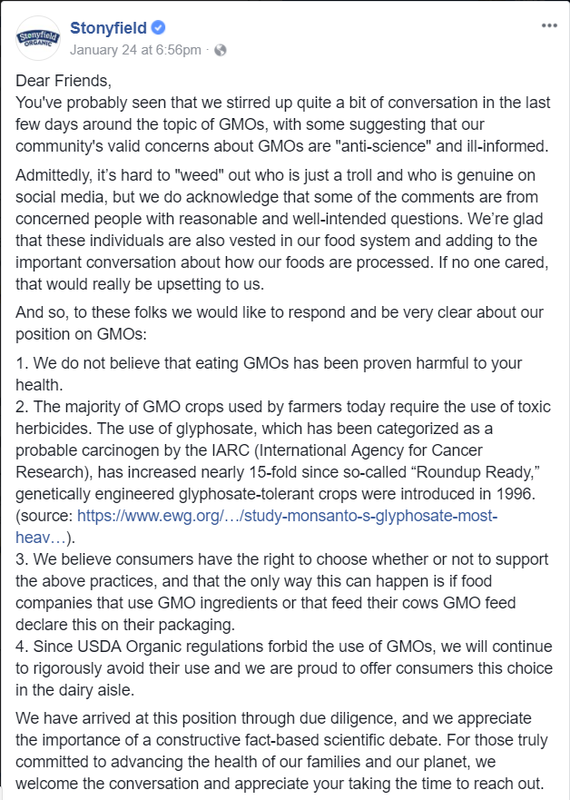 But I absolutely do not like the marketing tactics that the organic food industry uses. Organic marketing campaigns often target conventional farming practices and are based on scare tactics and misinformation. Long time followers might have an idea on how I feel about misinformation, especially when it is used intentionally for personal gain. For people new to my page, I abhor it. If the only way that you can sell a product is to make people think a competitors product will kill them, then there is something wrong, not only with your product, but with you. This video tries to pit the views of children against scientific evidence. As parents, if we listened to children about everything, they'd be eating candy and ice cream for breakfast while watching cartoons all day. When it comes science, it's better to trust scientists. Many scientific bodies have examined the evidence for and against GE crops and they have found the technology no more risky than other breeding methods. The US National Academy of Sciences even did an exhaustive review looking at every piece of evidence, either for or against, GE crops and found the supposed risks to be based on poorly conducted science. They reached the same conclusion that other scientific bodies have for the last 15 years; genetic engineering is no more risky than other breeding techniques. 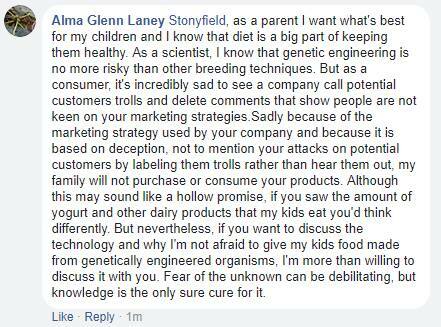 So using children to state that foods made from GE crops are bad is not only misleading, it is incredibly offensive. That's why people pushed back. But my offer to Stonyfield still stands. If you want to discuss the technology and why it's not something to be afraid of, I am still more than willing to do so. I'm a publicly funded scientist who believes strongly that one of my duties is to convey science to the public, especially since much of my education was paid for by the public through grants and student loans. This is one of the ways that I see myself repaying the opportunities that I've been given. So Stonyfield if you are interested, let me introduce to the wonders of modern agricultural technology and how it could be used to improve organic production systems. Oooh! Hi! I do have questions and now a source! Not about this... better way to ask? This page is part of an effort to flood social media with science and to engage the public in science-related issues. I work with plant viruses and the arthropods who vector them but I'll cover all aspects of virology here from human pathogens to archaea viruses and everything in between. Some general rules: Please be respectful of each other and we'll get along just fine. Spam will be deleted without notice. Remember to have fun and science hard! Note: The views expressed on this page do not necessarily represent the views of my employer and are mine alone.